In reading an old Flash comic I happened to see an ad for the CBS Saturday Morning Lineup from Fall 1981. If you all wonder why this is so special to me is because I was a born a month later on October 3rd, 1981. I saw the ad and decided to share it and talk about some of the shows on it during that time. I’ve always wanted to do a Saturday Morning Cartoon look from the 1980’s anyway and this is a good beginning for that project. Saturday Morning in the 80’s and 90’s was huge and the 80’s were insane with the lineups. The interesting part for me is realizing how many of these shows are pretty much gone from the airwaves now and the ones that are still around to this day. Get your cereal of choice and on with the flashback to CBS’s 1981 Saturday Morning Fall Lineup! Starting in order from 8:00 am it is The Kwicky Koala Show! Here’s the most interesting fact about The Kwicky Koala Show, it was one of the last things Tex Avery worked on. I had no idea about Avery’s involvement in this series. It also had The Bungle Brothers, Crazy Claws, and Dirty Dawg in short segments on the show too. I remember watching some of these episodes off of Cartoon Network in the early days of the channel. I can somewhat remember watching them on USA Cartoon Express too, but definitely Cartoon Network. It was produced by Hanna-Barbera Australia and only on for one season on CBS. Now I can somewhat remember these airing faintly but CBS had a show called In the News that aired in commercial breaks between the cartoons. They were two minute or so segments talking about events happening that would appeal to kids. That’s a pretty neat idea and I actually found one of the segments from 1980 and going to post it below so you can see it for yourselves. At 8:30 am on the CBS Saturday Morning Fall Lineup it was Trollkins. Another Hanna-Barbera toon, in watching the intro you can see the influence of Dukes of Hazzard on this show. Even if I didn’t read it on the Wikipedia page I’d be able to tell the influence from the start. It doesn’t look too bad though and I may have seen it once but I can’t remember it seeing it on Cartoon Network, though I may have seen it on Boomerang at one point. It was split into two shorts per episode and someone uploaded the first episode on youtube in two parts so if you’re curious here they are, enjoy! Now for 9 am it was the Bugs Bunny/Road Runner Show! There isn’t too much to say on this one though this is the same one you may remember being on ABC later on in their Saturday Morning line up as The Bugs Bunny and Tweety show. 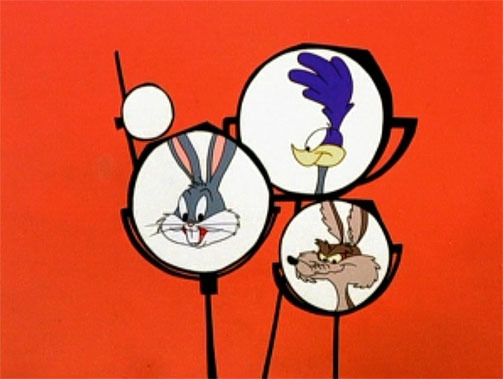 Yes at one point CBS aired the Bugs Bunny Show and paired it with The Road Runner show. I found the theme song from 1979 that had the two shows paired together so enjoy the theme song! At 10:30 am it is The Popeye and Olive Oyl Show! This is the show that had all new Popeye shows with new Olive Oyl shows as well. Originally it was the All-New Popeye Hour but then got trimmed down and became this show. I couldn’t find the theme song but I did find an episode of Private Olive Oyl on youtube so enjoy and see what you think. I wish the uploader could have had the original title card but I’ll take what I can get. At 11:00 am it is Blackstar! 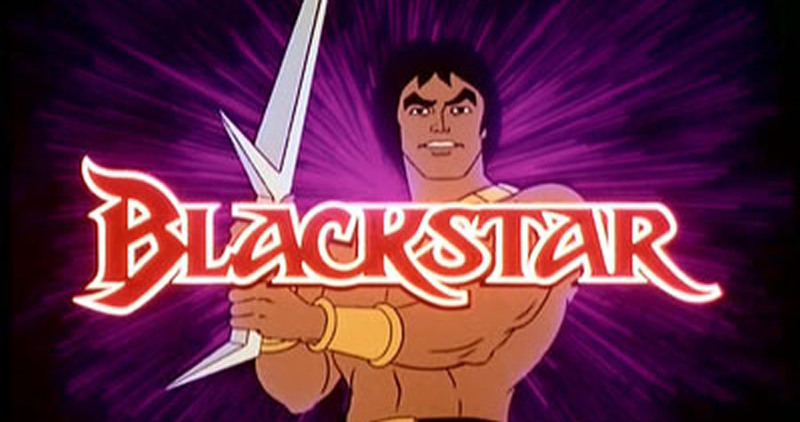 Now Blackstar is one show I saw a little of eons ago as it isn’t shown in reruns very often. This is part of the Filmation empire of shows. You know why I link the wiki to a lot of these shows? I’m learning about some of these the same way you are right now. I actually need to watch more of this at some point because despite the animation that intro for the most part makes the series look fun. Sadly it only ran for 13 episodes but some of the animation is kind of rough. It lasted one year on CBS Saturday Morning. If you’re curious about the intro, check it out below and enjoy! I did find the first episode of Blackstar on youtube so heck I may be watching the entire series sooner or later. Here’s the link if you’re curious about that as well. Then at 11:30 am it is the Tarzan/Lone Ranger/Zorro Adventure hour! Now originally this was the Tarzan and Lone Ranger hour but then it was expanded in this season to add Zorro to the hour. This is another Filmation show paired well with Blackstar. Though this was the final year of the hour as it ended in 1982 but this looks much better than Blackstar at least from the intro, check it out below. Now at 12:30 pm it is The Tom & Jerry Comedy Show! I didn’t realize that this aired on CBS for a couple years as it aired from 1980-1982. It was another Filmation series and I do remember this well actually. This did air in syndication when I watched Tom and Jerry as a kid so this is one I’m much more familiar with. I found the intro so if you’re curious check it out. Now for 1 pm it is The New Fat Albert Show and I’m mentioning it because of history and it was part of the lineup. 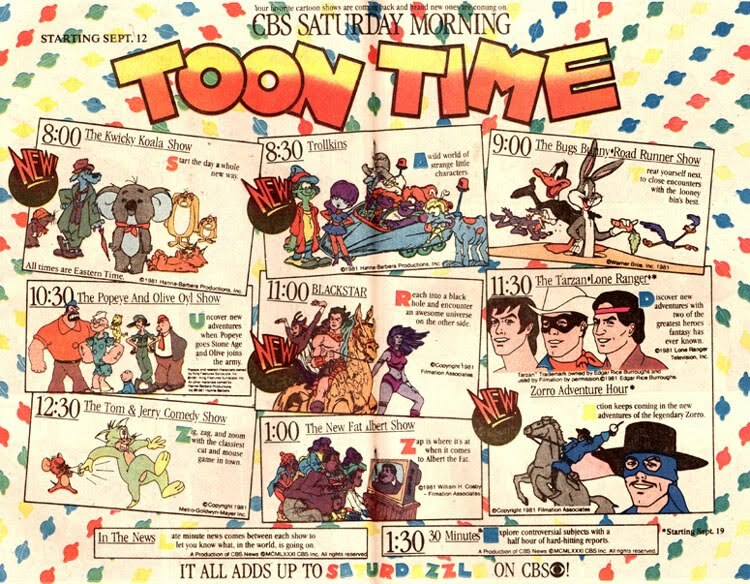 Then at 1:30 pm to finish out the CBS Saturday Morning for 1981 is 30 Minutes! I loved learning this part of my 1981 Saturday Morning research, it was a kid to teen friendly show with news stories focused on them. I never knew this existed and that’s pretty amazing. I can’t find any video for it sadly but now you know a fun new thing today along with me. That’s my first ever try at this, let me know what you think of this adventure I took. I’m also going to do more Saturday Morning Cartoon Lineups and even more From the Comic Pages stuff, I found another fun ad in The Flash comic I read that made me smile just as much. Thanks for reading and hope you enjoyed the journey as much as I did.